The teams were level seven times across the 80 minutes. Ballygunner's Pauric Mahony is surrounded by supporters at the end of the game. 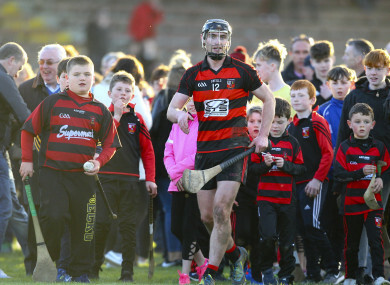 BALLYGUNNER DUG DEEP in extra time to emerge from a quarter-final epic with Thurles Sarsfields this afternoon and avenge last year’s defeat to the Tipperary champions. The teams were level seven times across the 80 minutes before late strikes by JJ Hutchinson and Pauric Mahony sealed their place in the last four. Fergal Hartley’s warriors, lining out for the seventh week in a row, lost talisman Brian O’Sullivan in the third quarter but subs David Walsh, Barry O’Sullivan and Hutchinson all got on the scoresheet. Philip Mahony soared high in defence once again while younger brother Pauric delivered 1-11, including a sensational solo effort, to clinch it. Midfielder Shane O’Sullivan also put in an exhausting effort. Padraic Maher inexplicably allowed a Mahony free creep to the net but he was heroic for Sars and two points in the second period of extra time kept them in the hunt. 2010 hurler of the year Lar Corbett scored four from play including the leveller at the end of the hour. Two points each from Corbett, Stephen Lillis and Aidan McCormack left the visitors 0-6 to 0-4 ahead after the first quarter. Pauric Mahony posted all four Ballygunner singles (three from play). On 20 minutes, Mahony didn’t have the distance from a free in front of the stand but Maher let the sliotar slip from his grasp and into the net. David O’Sullivan belted over a peach immediately afterwards. Conor Power extended the lead to four (1-7 to 0-6). A Lar Corbett special over the shoulder, his third from play, ended a 14-minute scoreless period for Sars. Billy McCarthy forced a save from Stephen O’Keeffe before Denis Maher pointed again. Mahony completed the first-half scoring as the Gunners reached the break 1-8 to 0-8 in front. Billy McCarthy blazed over O’Keeffe’s crossbar 15 seconds into the second period. Pauric Mahony and Peter Hogan maintained a two-point lead towards the end of the third quarter. The Waterford champions lost full forward Brian O’Sullivan to a shoulder injury. On 44 minutes, Conor Stakelum poked the ball past O’Keeffe after the Gunners number one denied McCarthy from point-blank range (1-12 to 1-11). Mahony (free) and sub David Walsh nudged Hartley’s charges back in front. Denis Maher then punished a sloppy clearance to make it 1-13 apiece. A mammoth point by Shane O’Sullivan raised the roof. Peter Hogan kicked over with the goal at his mercy. Stephen Cahill and Lar Corbett levelled the match for the sixth occasion and forced extra time. Mahony and David O’Sullivan left it 1-18 to 1-16 at the close of the first period. Pa Bourke and Maher tied the contest again but the men in red and black had a little bit extra in the tank. The Gunners will host Clare champs Sixmilebridge in the last four next Sunday. Scorers for Ballygunner: Pauric Mahony 1-11 (1-6fs), Peter Hogan, David O’Sullivan 0-2 each, Shane O’Sullivan, Conor Power, Brian O’Sullivan, David Walsh, Barry O’Sullivan, JJ Hutchinson 0-1 each. Scorers for Thurles Sarsfields: Lar Corbett 0-4, Conor Stakelum 1-0, Aidan McCormack (1f), Pa Bourke (2fs), Denis Maher 0-3 each, Padraic Maher, Stephen Lillis 0-2 each, Stephen Cahill, Billy McCarthy 0-1 each. Email “Gunners shade epic Munster Club quarter-final”. Feedback on “Gunners shade epic Munster Club quarter-final”.